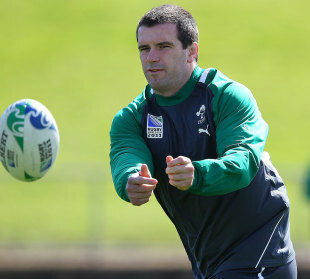 Shane Jennings has told his Ireland team-mates to back up their stunning victory over Australia by challenging for silverware at this World Cup. A quarter-final against Wales beckons after humbling the Tri-Nations champions and tournament second favourites 15-6 at Eden Park on Saturday. Further fixtures against Russia, in Rotorua on Sunday, and Italy in Dunedin one week later must be negotiated to guarantee passage into the knockout stages. But while Ireland are perfectly positioned to finish the group phase as Pool C leaders, Jennings insists it is time to put the Wallabies in the rear-view mirror. "It's a pool game and that's all it was," said the Leinster openside. "We want to win pool games and quarter-finals, but people have to understand that we're in this to win trophies. "That's the beauty of this squad, there are a lot of players who have been successful at provincial and international level. "I'm not playing it down, it was a brilliant and massive win for Ireland. But it was just a pool game. "Most people in the world saw it as an upset against Australia, but in the squad we know when we're playing well or going all right. "The senior players did a lot of talking during the build-up and they backed that up by playing well. "But it's gone now and people have to get over that because there's no point getting two wins and then falling over your next two opponents." Accounting for Australia has underlined Ireland's ability to deliver in big matches. In March they thumped Grand Slam-chasing England in Dublin, the conclusion to a wildly inconsistent RBS 6 Nations that rarely saw the team reach top gear. And four successive defeats during the warm-up games and an unconvincing display against the USA proved no barrier to seeing off the Wallabies. Securing a measure of consistency is now the key for Ireland and Jennings accepts they must not allow standards to slip. "Nobody in the squad wants to be known as hit and miss, producing one good performance and then failing to follow it up," he said. "We did a lot of good things Australia and we must repeat that. "We always felt we could compete with anyone in the world but this has definitely given us a bit of extra belief. Jennings denies that overcoming Russia, who are ranked 21 in the world, at Rotorua International Stadium is a foregone conclusion. "Russia are a physical side with a strong set piece and some dangerous runners. People keep calling these sides minnows, but they're not that bad at all. "We've got to play Russia and then Italy, who we didn't deserve to beat in Rome in the Six Nations."